Japanese LNG imports dropped by a considerable 0.65 Mt (9%) y/y to 7.30 Mt in December 2018. 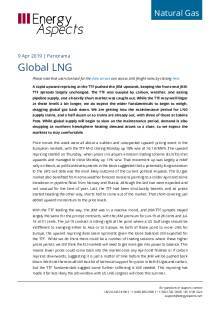 With LNG stocks at an 18-month high, winter buying is now over. Forecasts are pointing to a mild February-March, so the stage is set for a bearish 2019. Additionally, gas into power is set to slip y/y in Q1 19 owing to the base effects of the return of several nuclear units to service over March-October 2018. Given an exceptionally mild January, we have moderately revised our forecast for Q1 19 LNG imports—we now forecast a 1.83 Mt y/y drop, compared to a 1.7 Mt y/y fall previously. We expect LNG stocks to finish winter at 2.8 Mt, higher y/y by 0.12 Mt, which will limit restocking needs in summer 2019. We have revised our 2019 import forecast to show a 1.8 Mt y/y drop, with weakness through H1 19 being somewhat offset in H2 19. Our forecast for Japan’s LNG imports has been bearish for some time due to higher nuclear availability, a view compounded by mild weather in recent months. While a hot summer 2018 and Japan’s heavy Q3 18–Q4 18 restocking efforts led to higher y/y LNG imports over August–October 2018, mild weather in Q4 18 meant that the y/y LNG storage deficit that had persisted since March 2018 was fully eroded. Indeed, our balances put LNG stocks up by 0.24 Mt y/y by the end of December 2018, with total LNG storage just a touch under 3.9 Mt, the highest since June 2017. The mild start to the year has set the tone for weak end-user gas demand in Q1 19, and that trend will carry on through the rest of H1 19. January HDDs are on course to be 13% lower y/y, denting res-com and power demand. This follows a mild December 2018, when HDDs were a hefty 15% lower y/y and 3% lower than the seasonal average. The Japan Meteorological Agency is also forecasting above-average temperatures as being more likely than not in February and March. Additionally, a total of 5.7 GW of nuclear capacity was brought online from March 2018, so gas into power in H1 19 will reflect that baseline, with just that increase in capacity alone stimulating a 2.4 Mt y/y drop in total gas demand. With winter buying over, mild weather ahead and plenty of LNG in storage, we forecast that Q1 19 LNG imports will drop by 1.8 Mt (7%) y/y, but LNG stocks will still finish the winter 0.12 Mt higher y/y at just over 2.8 Mt. On the nuclear front, only the 0.8 GW Takahama unit 1 has some chance of a restart in the rest of 2019. The Nuclear Regulation Authority (NRA) and Kansai Electric are expected to need additional time to carry out final checks before any restart, pushing back the timing of the restart to Q4 19 at the earliest. The unit’s restart is also facing political headwinds, with the Fukui prefectural governor stating that he will not begin discussions on approving the reactor's restart until the central government of Japanese Prime Minster Shinzo Abe can prove the need for restarting a reactor that is 44 years old. If the governor refuses approval, that would also mean the 0.8 GW Takahama 2 plant, which is of a similar age, would not likely be allowed back—and that is otherwise currently one of the most likely plants to be restarted in 2020. In early January, the Chairman of Hitachi, Hiroaki Nakanishi, who is currently head of Keidanren, the Japanese business federation, said that the Japanese nuclear industry, and the government supporting it, could not force nuclear power on citizens of a democracy. Additionally, he pointed out the significant additional safety measures nuclear power companies are being forced to implement on units that are currently offline and have return dates that have been delayed repeatedly. Some commentators took the remarks as an ebbing of Keidanren’s support for nuclear power, while others took the view that Nakanishi was reminding the government that more support for the nuclear industry is needed. In other news, Chugoku Electric and its partner JFE Steel abandoned plans to develop a 1.1 GW coal-fired power plant near Tokyo, citing growing construction costs. The project was criticised last year by the environment minister. Still, few gas plants are in planning since the 1.1 GW Nishi Nagoya U7-2 facility achieved commercial operation at the end of March 2018.